Serves breakfast, lunch, dinner, drinks, coffee, and ice cream. Fast food, ice cream, coffee, shaved ice, baked goods, frozen coffees, hot chocolates, smoothies, and more. At the Clock of Williamston, we are focused on providing cook to order food with the highest levels of customer satisfaction. We will do everything we can to meet your expectations. Serving Breakfast, Lunch, and Dinner to the Belton community 7 days a week! Gyros, Phillysteak, Wings (bone in and boneless) Fish and Shrimp plates,Burgers and more. We deliver!!! Local deli serving lunch and dinner in Anderson. We are a Japanese express restaurant in Anderson, SC. Located on Main Street across from KFC. We have served the Anderson community for over 12 years. Now that you know where we are, come check us out!! A mission of this magnitude requires an obsession with quality, and it all begins with Fuddruckers fresh, never frozen, 100% USDA All-American premium-cut beef. Family owned and operated on Clemson Blvd. in Anderson since 1992! Offering daily lunch and dinner buffet, to-go and pick-up. Here at The Hook in Anderson, we have enjoyed serving our community with the freshest and highest quality seafood at the greatest value. With our friendly family environment, we are always striving to provide you, our customers, with excellent service for a memorable experience. We strive to be the best steakhouse in everything we do. One visit and you'll experience our grill master's Legendary Steaks like our center-cut Flo's Filet or Prime Rib. Visit your local Olive Garden located at Anderson, South Carolina for delicious Italian dishes perfect for the whole family. Nagoya Japanese Steak House offers delicious dining and takeout to Anderson, SC. We are independent Owned and Operated. We make your order fresh when you order.we are counter serve. Japanese restaurant serving sushi, hibachi, and teriyaki. Enjoy an Unlimited Buffet full of Pizza, Pasta, Salad and Dessert at Cicis, where we’re serving Anderson up with more 100% real cheese, more meat toppings and a garlic butter crust – all for one epically awesome price. Our Pizza is made with fresh dough served fresh for you in Anderson every single day at the Unlimited Buffet. We specialize in hot fresh sandwiches made with premium meats and cheeses, steamed to perfection, then piled high on a toasted private recipe roll. Our menu will surely satisfy your appetite! Firehouse Subs was founded by firemen who believe making awesome subs is great, but you need to do good, so now a portion of every purchase at Firehouse Subs goes towards providing lifesaving equipment for first responders in our communities. 4126 opened on October 13, 2017. We are located at 4126 Clemson Blvd, Anderson South Carolina 29621. We are a locally owned family establishment. 4126 is the Ashy family’s third restaurant along with The Boondocks and Carlee’s and Tony’s. How do you build a restaurant business from scratch in a fiercely competitive market? Jesús Sánchez, founder of “El Patron” Mexican Restaurants in 1998, did it with a simple three things: Fresh Quality Food, Good Service and a Very Comfortable Atmosphere. When people eat out, it’s only because the food is good. “Our fresh product and service has had to be good” says Jesus Sanchez, from Michoacan, Mexico. According to figures in the Independent Mail newspaper of Anderson, SC, “El Patron” is “the best” in the Casual Mexican Restaurant category. Great Mexican food in a family friendly environment! Easygoing mainstay for traditional Mexican dishes, including vegetarian options, in a low-key setup. Hola Amigos! Stop by and visit us at our newest location on Hwy 81 in Anderson. We guarantee freshness and friendly service. Hope to see y’all soon Amigos! Southern grill and bar for the whole family to enjoy. Pizza restaurant in Sandy Springs, SC... across the street from Michelin. Dining room closes from 2-4, Togo is still available at our Drive-Thru window. Loving people through great food, personal service, and building friendships. Louie's Bar and Grill is located in Anderson, SC off Exit 19B. Karaoke Wednesdays and live entertainment every Friday! Serving Stone Baked Pizza, Calzones, Hoagies, Salads, Vegan & Gluten-Free options with a wide selection of beer since 1974. Churchill's Pub is your local neighborhood bar and grill. Best burger in town! A place of family a place of diversity a place of love a place of fun! Lake side restaurant that offers fresh made food using locally sourced ingredients when possible. Bar area with wide selection of beers, wines and liquor. Tired of the same old bland flavors offered by Mexican restaurant? come and try the original home made flavors of Mexican traditional dishes. BREWS on Main is your local craft beer bottle/wine shop located in Anderson,SC. BREWS on Main has 16 taps of great craft beer! Sandwich Shop: Bird dogs are a local favorite. Raines on Main is a local restaurant serving wings, burgers, sandwiches, and many more delicious dishes! Maki Sushi Bar & Bistro features a selection of high quality sushi, appetizers, small plates and entrees. MaKi Sushi Bar & Bistro makes dining a special experience. A unique craft beer buying experience. American bistro with delicious entrees. A local favorite! Italian and Southern Home Cooking. Sushi with wonderful lake views. Choose your yougurt and choose your topping. Delicious on a hot day. 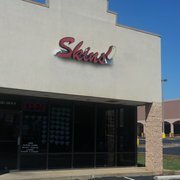 Skins in known for its great Hot Dogs. Neighborhood hangout since 1971 offering burgers, beers & mixed drinks, plus pool & a patio. Great desserts or even lunch. Daily blue plates and soups and salads. Fresh entrees, locally sourced and delicious. Ecity Java brings the big town coffee feel to a small town reality. Burgers and Shakes, open late. The hot bean dip that is served with chips is incredible. Try the "world famous" chicken club. It's delicious! Noodle dishes, rice entrees & other fare from Thailand served in an unassuming restaurant. An array of typical American, Italian & Greek plates whipped up in laid-back surroundings. Worth standing in line for, this BBQ is out of this world. Cigar Lounge and full-service bar. Arts & Entertainment · Barbecue Restaurant. CocoBon Chocolatier confections are hand made from special recipes. Longtime counter-serve stop for classic BBQ & sides in casual, wood-paneled digs with old signage. Upscale asian with great atmosphere. Unique, Local, Farm, Fresh, Southern Homestyle. Reasonably priced and undeniably great food, made from local, fresh ingredients. Giant juicy burgers with all the fixings. Irish pub atmosphere and hearty fare make this a local favorite. Awesome hotdogs and daily specials. Serving hot dogs in Anderson for decades. Great steaks and cold beer. Delicious homemade dessserts and food. Located in an historic Farmers Hall this café is charming. Great local pub, a local favorite. Steaks, a great place to dine on the lake.